We are living in "beastly" days‑we are seeing what man looks like when all restraints are removed, when all fear of God is removed. When sin is blatant we need to recognize that this world is not our home. The world wants no restraints. Christians look at things different: in death we look to life, in trials we look to holiness, in poverty we look toward our heavenly inheritance, in sorrow, sickness and tears we look toward the time when God will wipe away all our tears. We are despised and called to suffer for His Name's sake but we can confidently look forward to the day when we will reign with Christ. through this chapter on the 4 beasts? We need to understand how Daniel 7 relates to Daniel 2 and then in light of these incredible prophecies we need to purpose in our heart as to how we shall live. Daniel 1‑6 Nebuchadnezzar had the dreams and Daniel was the interpreter. Daniel 7‑12 Daniel has visions and dreams and angelic beings interpret. From Daniel 2:4b through Daniel 7:28, the original text is written in Aramaic which leads to another way one can divide the book of Daniel. Daniel 8‑12 = The story shifts focus to the nation of Israel and takes it all the way to the end of history as we know it. All of Daniel's prophetic portions have been fulfilled except for one segment and we are living at a time when we may well see even this segment fulfilled! (Editorial note: Donald Campbell, former president of Dallas Theological Seminary, sums up this section writing that "Daniel 7 concludes the first major section of the book, which describes the destinies of the nations of the world. With chapter 8 we turn a corner and find the emphasis to be on the destiny of the nation of Israel". Daniel 7 ‑ Daniel's dream and vision took place approximately 553BC, actually before the events in Daniel 5 (which marks the defeat of Belshazzar and Babylon by the Medes and Persians in about 539BC) between Daniel 4 & 5 in about 553BC, approximately 14 yrs before Daniel 5. It is worth noting that Daniel had 4 visions (Daniel 7:1, Daniel 8:1, Daniel 9:1, 21 and Daniel 10:1-12:11) and all four visions occurred during the historical period of Daniel 1-6. 1 In the first year of Belshazzar king of Babylon Daniel saw a dream and visions in his mind as he lay on his bed; then he wrote the dream down and related the following summary of it. 2 Daniel said, "I was looking in my vision by night, and behold, the four winds of heaven were stirring up the great sea. 3 "And four great beasts were coming up from the sea (cf Revelation 13:1), different from one another." God let's His children know what is coming to pass so that we will not be caught unaware –­ He doesn't give us all the details but He does give us signs along the way so that we know where we are on our journey. 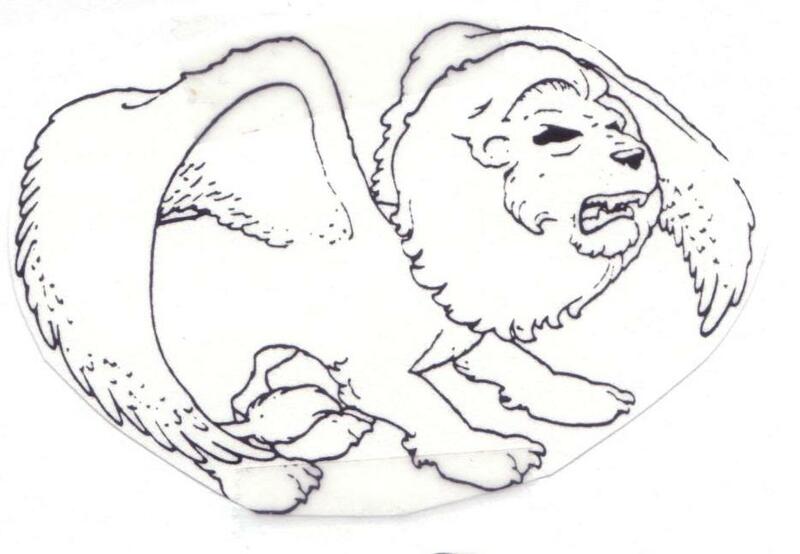 Description of Lion with wings like an Eagle with wings plucked which is very similar to Nebuchadnezzar's dream of the tree which was man and was great like the lion was great but which was reduced to an animal and then lifted back on its feet and given a human mind. 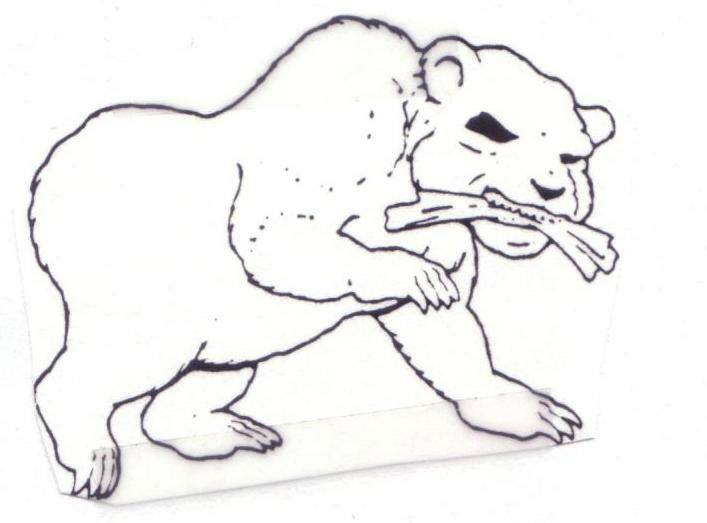 The image of Beast #1 corresponds to the HEAD OF GOLD in Chapter 2. "say now to the rebellious house, 'Do you not know what these things mean?' Say, Behold, the king of Babylon came to Jerusalem, took its king and princes, and brought them to him in Babylon." So in this riddle, God likens the king of Babylon to an eagle, a bird that generally was held to be the "king" of the sky. Here in Daniel 7, the eagle had his wings plucked wings which suggests a humbling event. Babylon was built rapidly which may explain the wings of eagle, but one cannot be dogmatic. Thus we see that the lion and the eagle were both symbols of Babylon elsewhere in Scripture. BABYLON ‑ (see Babylon, history and religion) To be a student of prophecy you need to be alert to what God says about Babylon (The name "Babylon" occurs at least 260 verses --click for verses-- in the NASB and is found in 100 out of 1372 chapters in the Bible mostly in the prophetic books!). Babylon means "gate of the god". The city covered 2000 acres and was located along the Euphrates in modern day Iraq. 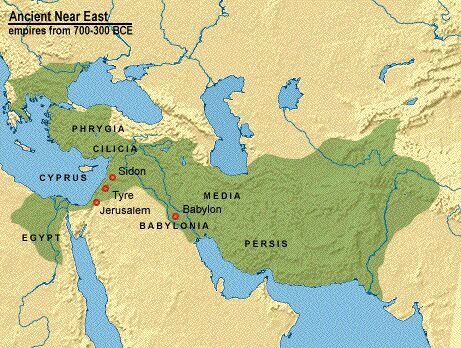 Babylon had control of the major trade routes. Prior to the war in Iraq in 2003, there was an ongoing effort to re‑build Babylon in honor of Saddam Hussein! 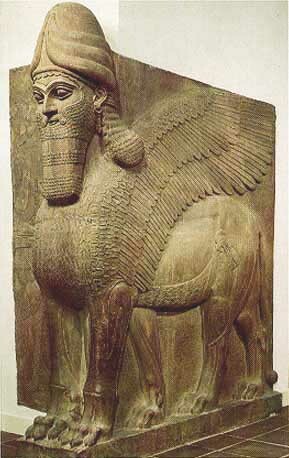 Babylon had a Ziggurat (click picture above, cp Babel, tower of see also Wikipedia) for their chief false god, Marduk, who was held to be the lord of the foundation of heaven and earth. The following news item relating to "Babylon"
The American ambassador to Iraq, Zalmay Khalilzad, who many see as the country's most powerful man, has promised to renovate Babylon. Khalilzad made the pledge while touring the old city, one of the seven wonders of the ancient world. He also vowed to spend $20 billion on upgrade infrastructure in the country's 18 provinces. Like almost everything in Iraq, Babylon has suffered a great deal in the aftermath of U.S.-led occupation of the country. The ancient city was used as a military headquarters for the coalition troops and scientists say many of its buildings, relics, and remaining artifacts and ruins have been destroyed. Khalilzad, who on Tuesday escaped a mortar attack in a visit to the northern city of Tikrit, said he would allocate $230 million for the Province of Babel and its capital Hilla situated close to the ruins of Babylon. Daniel 7 gives us insight into the real character of the "head of gold" which is described as "like a lion". The Lion, bear, etc probably symbolize the "beastly" character of these kingdoms opposed to God and therefore are also opposed to the children of God. The beastly kingdoms rejected the knowledge of God and in turning away they became very beastly in character‑ ‑anti‑God and anti‑Christian. A Bear is less swift. Next to the lion, bears were the most ferocious beasts in Palestine. The three ribs is somewhat enigmatic but most observers agree that it probably represents the three rulers, nations or empires they conquered, Babylon, Lydia (Turkey) and Egypt. In the depiction of the large statue in Daniel 2 the two arms clearly indicates the combination of Medes and Persians; but the fact that it was "raised up on one side" would point to what we saw historically of the rise of the Persians to greater power than the Medes. 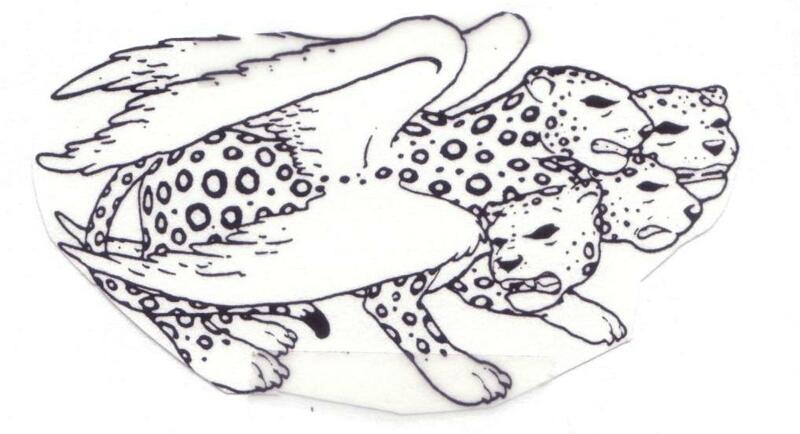 "After this I kept looking, and behold, another one, like a leopard, which had on its back four wings of a bird; the beast also had four heads, and dominion was given to it (cf Daniel 2:21 where we see that God "removes kings and establishes kings"). Alexander's practice not to "crush" the conquered countries. Alexander died suddenly at age of 33yo before he had made provision for a successor. He had 5 generals, one of whom faded out, leaving 4 generals who (about 20 years after his death) divided his kingdom into 4 parts (which equates with the 4 HEADS OF THE LEOPARD) (See Lecture 13 for more detailed discussion). Remember that this vision occurred during Belshazzar's reign, before the Medes and Persians had conquered Babylon and before Greece was even a world power! And yet Peter writes that the Word of God we hold in our hand today is "a prophetic word made more sure" (2Peter 1:19)! "After this I kept looking in the night visions, and behold, a fourth beast, dreadful and terrifying and extremely strong; and it had large iron teeth. It devoured and crushed, and trampled down the remainder with its feet; and it was different from all the beasts that were before it, and it had ten horns. When Rome conquered, they crushed their enemies. The strength of Aurelian (Romanian emperor from 270–275BC) had crushed on every side the enemies of Rome. (Gibbon, E. The History of the Decline and Fall of the Roman Empire). In 63BC the Roman General Pompey (106–48BC), a rival of Julius Caesar, conquered Jerusalem. As a general rule of practice Rome literally destroyed civilizations, killing by the thousands and making slaves of hundreds of thousands. The point is that when Rome defeated a nation, it crushed that nation instead of embracing it. Matthew 2:11-20 records the decree of King Herod (who largely depended on the power of Rome for his power) to destroy the Messiah. And they came into the house and saw the Child with Mary His mother; and they fell down and worshiped Him; and opening their treasures they presented to Him gifts of gold and frankincense and myrrh. 12 And having been warned by God in a dream not to return to Herod, they departed for their own country by another way. 13 Now when they had departed, behold, an angel of the Lord appeared^ to Joseph in a dream, saying, "Arise and take the Child and His mother, and flee to Egypt, and remain there until I tell you; for Herod is going to search for the Child to destroy Him." 14 And he arose and took the Child and His mother by night, and departed for Egypt; 15 and was there until the death of Herod, that what was spoken by the Lord through the prophet might be fulfilled, saying, "OUT OF EGYPT DID I CALL MY SON." 16 Then when Herod saw that he had been tricked by the magi, he became very enraged, and sent and slew all the male children who were in Bethlehem and in all its environs, from two years old and under, according to the time which he had ascertained from the magi. 17 Then that which was spoken through Jeremiah the prophet was fulfilled, saying, 18 "A VOICE WAS HEARD IN RAMAH WEEPING AND GREAT MOURNING, RACHEL WEEPING FOR HER CHILDREN; AND SHE REFUSED TO BE COMFORTED, BECAUSE THEY WERE NO MORE." 19 But when Herod was dead, behold, an angel of the Lord appeared^ in a dream to Joseph in Egypt, saying, 20 "Arise and take the Child and His mother, and go into the land of Israel; for those who sought the Child's life are dead." These passages illustrate how Herod (in a sense representing Rome) tried to crush the Messiah. "While I was contemplating the horns, behold, another horn (Note: in addition to the 10), a little one, came up among them, and three of the first horns were pulled out by the roots before it; and behold, this horn possessed eyes like the eyes of a man, and a mouth uttering great boasts. "A river of fire was flowing and coming out from before Him. Thousands upon thousands were attending Him, and myriads upon myriads were standing before Him. The court sat, and the books were opened....'the court will sit for judgment, and his dominion will be taken away, annihilated and destroyed forever." There is a day when the books will be opened and these beasts will be judged, even though it may look like these beasts are winning now, but the Little horn and the beasts will be judged and destroyed. "I kept looking in the night visions, and behold, with the clouds of heaven One like a Son of Man was coming, and He came up to the Ancient of Days And was presented before Him." The Son of Man in this context is the Messiah and interestingly represents the only OT reference to Him as the Son of Man. In contrast there are 84 passages in NT (Mt 8:20; 9:6; 10:23; 11:19; 12:8, 32, 40; 13:37, 41; 16:13, 27f; 17:9, 12, 22; 18:11; 19:28; 20:18, 28; 24:27, 30, 37, 39, 44; 25:31; 26:2, 24, 45, 64; Mk 2:10, 28; 8:31, 38; 9:9, 12, 31; 10:33, 45; 13:26; 14:21, 41, 62; Lk 5:24; 6:5, 22; 7:34; 9:22, 26, 44, 56, 58; 11:30; 12:8, 10, 40; 17:22, 24, 26, 30; 18:8, 31; 19:10; 21:27, 36; 22:22, 48, 69; 24:7; John 1:51; 3:13f; 5:27; 6:27, 53, 62; 8:28; 9:35; 12:23, 34; 13:31; Acts 7:56; Heb 2:6; Rev 1:13; 14:14) in which Jesus refers to Himself as the "Son of Man", which is almost as if He is saying "listen to Daniel's prophecy". "the sign of the SON OF MAN will appear in the sky, and then all the tribes of the earth will mourn, and they will see the ' SON OF MAN COMING ON THE CLOUDS OF THE SKY with power and great glory." Jesus became the Son of Man when Mary gave birth to Him, so "Son of Man" refers to Jesus in His incarnate state, fully God and fully Man. When Jesus Christ ascended He ascended bodily and will return bodily as a perfect Man. Because He sits today at the right hand (the hand of power) of God the Father, we will someday reign with Him (sit with Him) as man. Are all peoples, nations men serving Him now? Obviously not. Note the parallel between the toes (10) of Daniel 2 statute (Da 2:41,42) and the 10 horns of Daniel 7 (Da 7:7, 20, 24). Da 2:34, 35 "You continued looking until a stone was cut out without hands, and it struck the statue on its feet of iron and clay, and crushed them. Then the iron, the clay, the bronze, the silver and the gold were crushed all at the same time, and became like chaff from the summer threshing floors; and the wind carried them away so that not a trace of them was found. But the stone that struck the statue became a great mountain and filled the whole earth. Da 2:44, 45 "And in the days of those kings the God of heaven will set up a kingdom which will never be destroyed, and that kingdom will not be left for another people; it will crush and put an end to all these kingdoms, but it will itself endure forever. 45 "Inasmuch as you saw that a stone was cut out of the mountain without hands and that it crushed the iron, the bronze, the clay, the silver, and the gold, the great God has made known to the king what will take place in the future; so the dream is true, and its interpretation is trustworthy." The 10 toes, and 10 kings point to a time yet future because the little horn's kingdom comes to an end when the Ancient of Days comes. WE HAVE JUST BEGUN TO STUDY ONE OF THE MOST EXCITING PORTIONS OF PROPHECY IN THE WORD OF GOD (Ed note: Dr John Walvoord the dean of modern prophecy writes that Daniel 7 "provides the most comprehensive and detailed prophecy of future events to be found anywhere in the Old Testament" Walvoord, Daniel, Chapter 7 Daniel’s Vision Of Future World History). If you want to understand the times, then you need to study the book of Daniel and keep your eyes on Israel. Israel is God's time piece and it's "almost midnight." You will see the signs of the times and because of your knowledge of the book of Daniel, you will know when the clock is about to "strike 12". You can know that all the DREADFUL BEASTS that have sought to devour the kingdoms and peoples of this world and to quench, crush and put an end to Christianity, will soon themselves come to an end because THERE IS A KING COMING TO BRING IN A KINGDOM & THE SAINTS OF THE MOST HIGH ARE GOING TO POSSESS THAT KINGDOM WITH HIM! Will you? Daniel 1:8-note But Daniel MADE UP HIS MIND (literally "put in his heart" or "purposed in his heart") that he would not defile himself with the king's choice food or with the wine which he drank; so he sought permission from the commander of the officials that he might not defile himself. Daniel 3:17,18-note "If it be so, our God whom we serve is able to deliver us from the furnace of blazing fire and He will deliver us out of your hand, 0 king. But even If He does not, lot It be known to you, 0 king, that we are not going to serve your gods or worship the golden image that you have set up." Father, thank You for Your Word. Thank You that it is a Light that shines in a dark place. As we study to show ourselves approved unto You, workmen that need not to be ashamed, we pray that You Father would open the eyes of our understanding. In Your Name. Amen. Well, Beloved we have had you in Daniel and Revelation and Kay wants to know if your head is spinning. Are you dreaming about beasts? Are you seeing horns coming out of people? Are you wondering who the leopards and bears and all these things are? And do you think ‘I will never get it'? Kay wants you to know you will. Kay tells us what will happen if we study prophecy: when you study prophecy you must keep working with the text and working with the text and getting to know the text and understanding the text. God will begin to put it together and one day, Kay promises us, we will get the ‘Ah ha' moment when our eyes light up and we begin to make the connections. Kay has studied prophecy for years. Prophecy is not just for old timers, it's not just for those that are seasoned in the Word of God. When Paul wrote his first epistle to the church at Thessalonica (1 Thessalonians) and every chapter ends with a reference to the coming of the Lord. He tells them they know these things because he's taught it to them. And yet in Thessalonians he also says ‘let me explain this to you'. So he adds to what he has taught. And this is what we are doing; we are building precept upon precept. We are getting a truth, we're adding another truth, and we're adding another truth. We are taking scripture and are comparing scripture with scripture so we can see how it all fits together. We need to understand that the Bible is a progressive revelation. It is a progressive unveiling of truth. God has not chosen to give it to us all at once. So he starts at Genesis and starts to unveil the truth so that when we read Revelation if you know Genesis you say ‘Oh, that's what He was talking about'. For instance, in a book Kay has written titled Teach Me to Study the Bible in 28 Days she goes through Jude. It's an interactive book where you learn to basic skills of observation, interpretation and application. Daniel 7 - As we look at the end of the chapter there are things to see about the little horn that becomes a big horn. Then we will go to Revelation 11-13 and put it together for us. Prophecy is something we need to hear over and over again. And as we do it settles in our mind, heart, and we think about it and we can use it as a plumb line for everything we read and hear in the news. Four great beasts came out of the sea and He gives us an overview of these four beasts and details of the four beasts. Then God gives Daniel a vision of the Ancient of Days and one like a Son of Man being presented to the Ancient of Days. Daniel 7:2, Daniel said, "I was looking in my vision by night, and behold, the four winds of heaven were stirring up the great sea. And four great beasts were coming up from the sea, different from one another. Note the vision in Da 7:2 and the interpretation in Da 7:16. And then He begins to give us the interpretation. He says forever and then He explains that it is for all ages to come. So He's telling us the end of the story in which the saints of the Highest One (saints means holy ones, set apart ones, believers in the OT and the NT) will receive the kingdom and possess the Kingdom for all ages. Recall that the church is not mentioned in the Old Testament. In Ephesians we learn that the church is a mystery revealed in the NT. The mystery is that Jews and Gentiles will be in one body. Many times we read the Bible and fail to let the Bible say what is says. Instead we read the Bible through the glasses of our theology, of what we have been taught by others. God wants us to look at the Word of God not through anyone else's glasses but to observe the Word in an unhindered, unbiased fashion allowing the Spirit to teach us, which is the essence of inductive study. The Jewish readers would understand that this reference is to the holy ones, those in Israel who believe God. The "saints of the Highest One" is not a reference to the church which is a mystery. Daniel 7:19, 20 "Then I desired to know the exact meaning of the fourth beast, which was different from all the others, exceedingly dreadful, with its teeth of iron and its claws of bronze, and which devoured, crushed and trampled down the remainder with its feet, 20 and the meaning of the ten horns that were on its head and the other horn which came up, and before which three of them fell, namely, that horn which had eyes and a mouth uttering great boasts and which was larger in appearance than its associates. In other words "I want to know about the beast with the 10 horns and especially the little horn". Daniel 7:8 tells us that a little horn comes up among the ten and Daniel 7:20 tells us that he has eyes and a mouth and is larger than the other horns. We know these saints are going to eventually reach the Kingdom. The little horn wages war with the saints and overpowers them. What do we know about these saints? We know that these saints are eventually going to receive the Kingdom and that these are the same saints that are overpowered by the horn who wages war against them. Daniel 7:22 until the Ancient of Days came and judgment was passed in favor of the saints of the Highest One, and the time arrived when the saints took possession of the kingdom. We want to mark every reference to the saints. What has He already told us? He's told us two times that the saints are going to take possession of the Kingdom. He does not want us to miss this. He also wants us to know that the little horn is going to wage war against the saints and he is going to overpower them until. Daniel 7:22, 23 until the Ancient of Days came and judgment was passed in favor of the saints of the Highest One, and the time arrived when the saints took possession of the kingdom. 23 Thus he said: 'The fourth beast will be a fourth kingdom on the earth, which will be different from all the other kingdoms and will devour the whole earth and tread it down and crush it. Observe that this fourth kingdom is different from the others. The fourth kingdom will devour the whole earth and tread it down and crush it, the whole earth. Some people say that this "kol" (whole) and "ara" (earth) could refer to and has been used to refer just to the Middle East. Is this the whole earth or just the Middle East. As we read something like that in a commentary we must not accept that as a final decision but allow Scripture is to interpret scripture. Daniel 7:24 As for the ten horns, out of this kingdom ten kings will arise; and another will arise after them, and he will be different from the previous ones and will subdue three kings. What have we observed about the little horn? (3) He arises after the ten (this is very important) and when he arises he is different from the others and subdues three of the ten. Daniel 7:25 'He will speak out against the Most High and wear down the saints of the Highest One, and he will intend to make alterations in times and in law ; and they will be given into his hand for a time, times, and half a time. (4) He speaks out against the Most High. (5) He will wear down the saints of the Highest One. (6) He intends to make alterations in times and in law. What does this mean? He may say this is no longer A.D. this is such and such; we're starting the calendar again. Or he may make alterations in times other ways. (7) The saints are given into his hands for time, times and half a time which is 42 months, 1260 days, 3½ years. A ‘time' = 1 year, times = 2 years and then a half. So God has told us that the saints will be given into the little horn's hands for time, times, and half a time and is going to wage war against the saints and is going to overpower for 3½ years. And yet in spite of this difficult time, God promises that the saints will receive the Kingdom. So they will be overpowered for only 3½ years and must endure because they will receive the Kingdom. The little horn's rule over the whole earth is brief and we need to remember that the Kingdom is coming. He doesn't want us in the dark. We are children of light not of night but of day. So these things are not to overtake us like a thief in the night because we understand what is going to happen. The little horn is going to be annihilated and the sovereignty, etc will be given to the people of the saints of the Highest One – not just to the saints of the Highest One but to the people of the saints of the Highest One. What does it mean, it doesn't tell us. (8) The little horn's dominion is taken away, annihilated and destroyed forever. For more detail we must go to the book of Revelation which is the unveiling of the things that are shortly going to come to pass. Revelation 1:1 says this is the revelation of Jesus which God gave to Jesus to show to His bond servants (that's us) the things that must shortly take place. So here is a book that is given to Jesus and He in turn gives it to His angel, His angel gives it to John on the Isle of Patmos and John sits down and writes it in a letter and sends it to the seven churches which are in Asia. This is what Revelation is: it's about the things that must shortly take place. Go to Revelation 11. Keep in mind everything we've learned in Daniel we are going to put it together. Revelation 11 mentions a beast for the first time in the book of Revelation. We studied about beasts in Daniel so when we are reading Revelation see the word beast and we've done our homework and we have our notes and an analysis of this forth beast that is going to be there when Jesus sets up His Kingdom or when God sets up His Kingdom. And when the saints take possession of it and we see the word beast we should ask "is this the same beast". Is there any connection? In Revelation chapter 11 he is told to measure the temple of God and the altar. Revelation 11:1 Then there was given me a measuring rod like a staff; and someone said, "Get up and measure the temple of God and the altar, and those who worship in it. Now, he's to measure those who worship in it. What we know from Revelation 11:1 is that there's going to be a temple, an altar and people worshiping in it. The question would be "what temple"? Well, as we study it we'll see this is the temple of God. So we know the temple of God has to be reveled if they are measuring it. Revelation 11:2 Leave out the court which is outside the temple and do not measure it, for it has been given to the nation; and they will tread under foot the holy city for forty-two months. Forty-two months equates with 3½ years. We studied about 3½ years in Daniel maybe there's a connection. Is it the same or is it different? Well, let's see what it says. Do not measure the court outside because it has been given to the nations. We note that there is a temple in Jerusalem. Note "has been given" a repeated phrase. It's been given to the nations and they are going to tread underfoot the holy city for forty-two months. So what we see here is that they are going to tread under the holy city, Jerusalem, for forty-two months, for 3½ years. Twelve hundred and sixty days in Jewish reckoning is 3½ years. Revelation 11:4 These are the two olive trees and the two lampstands that stand before the Lord of the earth. Zechariah discusses two lampstands and olive trees. Revelation 11:5 And if anyone wants to harm them, fire flows out of their mouth and devours their enemies; so if anyone wants to harm them, he must be killed in this way. If anyone tries to harm one of the witnesses with a gun, knife, fist all the witness has to do is breath fire on him. Revelation 11:6, 7 These have the power to shut up the sky, so that rain will not fall during the days of their prophesying ; and they have power over the waters to turn them into blood, and to strike the earth with every plague, as often as they desire. 7 When they have finished their testimony, the beast that comes up out of the abyss will make war with them, and overcome them and kill them. We know the two witnesses operate for 1260 days (3½ years) and they have great power. We have the temple in Jerusalem and outside the temple are the nations that are able to trample down the city for 3½ years. But we know that after the 2 witnesses have been witnessing for 3½ years the beast comes and kills them. Revelation 11:8 And their dead bodies will lie in the street of the great city which mystically is called Sodom and Egypt, where also their Lord was crucified. These two witnesses lay dead in the great city of Jerusalem where their Lord Jesus was crucified. Revelation 11:9, 10, 11, 12 Those from the peoples and tribes and tongues and nations will look at their dead bodies for three and a half days, and will not permit their dead bodies to be laid in a tomb. 10 And those who dwell on the earth will rejoice over them and celebrate; and they will send gifts to one another, because these two prophets tormented those who dwell on the earth. 11 But after the three and a half days, the breath of life from God came into them, and they stood on their feet; and great fear fell upon those who were watching them. 12 And they heard a loud voice from heaven saying to them, "Come up here." Then they went up into heaven in the cloud, and their enemies watched them. The dead bodies lie in the street for 3½ days and then are miraculously "caught up" to heaven. This section of the Revelation is the first mention of the beast. Revelation 12:1, 2 A great sign appeared in heaven: a woman clothed with the sun, and the moon under her feet, and on her head a crown of twelve stars ; 2and she was with child ; and she cried out, being in labor and in pain to give birth. So he gives us a vision of a pregnant woman that is in labor and is crying out, that wants to give birth to this child. Then he stops and gives us another vision. Revelation 12:3 Then another sign appeared in heaven: and behold, a great red dragon having seven heads and ten horns, and on his heads were seven diadems. We've read about another beast that has 10 horns. It didn't say anything about seven heads but it was 10 horns. So here's a dragon, seven heads, 10 horns. Here's a woman, pregnant, about to give birth. The dragon is there and wants to kill the child. Revelation 12:5, 6 And she gave birth to a son, a male child, who is to rule all the nations with a rod of iron; and her child was caught up to God and to His throne. 6 Then the woman fled into the wilderness where she had a place prepared by God, so that there she would be nourished for one thousand two hundred and sixty days. If you were to sketch this scene you would have a woman, a dragon, and the woman giving birth to a child and the dragon trying to destroy the child. But the child is caught up to heaven to God's throne. • The sun and the moon are under her feet. • She wears a crown with twelve stars. • She becomes pregnant, gives labor, and gives birth to a child. • Someone tries to kill the child. • The child is a male child. • This child is to rule all the nations with a rod of iron. • The child is caught up to God on His throne. We know that the Messiah must come from the seed of Abraham, from the tribe of Judah, from the household of David. We know that He is going to be born of a virgin. We know in Matthew when He is born Herod who is part of the Roman Empire seeks to kill every male two years and under because he's heard the Messiah has come. Genesis 37:5, 6, 7, 8, 9 Then Joseph had a dream, and when he told it to his brothers, they hated him even more. 6 He said to them, "Please listen to this dream which I have had; 7 for behold, we were binding sheaves in the field, and lo, my sheaf rose up and also stood erect ; and behold, your sheaves gathered around and bowed down to my sheaf." 8 Then his brothers said to him, "Are you actually going to reign over us? Or are you really going to rule over us?" So they hated him even more for his dreams and for his words. 9 Now he had still another dream, and related it to his brothers, and said, "Lo, I have had still another dream; and behold, the sun and the moon and eleven stars were bowing down to me." Some interpret the woman of Revelation 12:1 as the church. But did the church give birth to a male that was to rule with a rod of iron? Psalm 2 says that the Christ, the Son of God, the Promised One from the Father is going to rule all nations with a rod of iron. The church does not give birth to Christ, but Christ gives birth to the church. So the woman of Revelation 12 could not be the church. Revelation 12:7, 9 And there was war in heaven, Michael and his angels waging war with the dragon. The dragon and his angels waged war, 9 And the great dragon was thrown down, the serpent of old who is called the devil and Satan, who deceives the whole world ; he was thrown down to the earth, and his angels were thrown down with him. In Rev 12:7 there is a war in heaven. We know that the dragon is Satan and that He has seven heads and ten horns. We see that he's thrown down, he deceives the whole earth. We see in verse 9 he's thrown down to the earth. His angels were thrown down with him. Revelation 12:10, 12 Then I heard a loud voice in heaven, saying, "Now the salvation, and the power, and the kingdom of our God and the authority of His Christ have come, for the accuser of our brethren has been thrown down, he who accuses them before our God day and night.12 For this reason, rejoice, O heavens and you who dwell in them. Woe to the earth and the sea, because the devil has come down to you, having great wrath, knowing that he has only a short time." In Rev 12:7-12 we read about a war in heaven between the dragon and Michael and how Satan is thrown down. All Kay does is get the facts. Just get the details and let them sit there because God will begin to put them together. Revelation 12:13 And when the dragon saw that he was thrown down to the earth, he persecuted the woman who gave birth to the male child. We are back with the dragon and the woman. So he's going to tell us more about the dragon and the woman. When he was thrown down to earth – now he's going to tell me when the dragon will start persecuting the woman. He starts persecuting the woman when he's thrown down to earth. He's thrown down to earth because there's a war in heaven between Michael and his angels. He's just connected Rev 12:13 with Rev 12:4,5, 6. Rev 12:14 – fly into the wilderness – geographical location. We've seen wilderness in Rev 12:6. God has just connected twelve hundred and sixty days with time, times, and half a time or 3½ years. Revelation 12:15-17 And the serpent poured water like a river out of his mouth after the woman, so that he might cause her to be swept away with the flood. 16 But the earth helped the woman, and the earth opened its mouth and drank up the river which the dragon poured out of his mouth. 17 So the dragon was enraged with the woman, and went off to make war with the rest of her children, who keep the commandments of God and hold to the testimony of Jesus. The woman hides and the devil makes war with the rest of her offspring. So this woman has reproduced in someway – not the male child. We know the offspring keep the commandments of God and hold to the testimony of Jesus. Revelation 13:1,2 And the dragon stood on the sand of the seashore. Then I saw a beast coming up out of the sea, having ten horns and seven heads, and on his horns were ten diadems, and on his heads were blasphemous names. 2 And the beast which I saw was like a leopard, and his feet were like those of a bear, and his mouth like the mouth of a lion. And the dragon gave him his power and his throne and great authority. Some manuscripts have ‘I' instead of dragon standing on the sand. We've seen this beast in Revelation 12:3. We've seen the leopard, bear and lion in Daniel 7. God has told us the dragon is the devil. We know the dragon is able to do this because the whole world lies in the power of the evil one. 1John 5:19 We know that we are of God, and that the whole world lies in the power of the evil one. We know the kingdoms of this world are going to be given to Christ but we know Satan that is the prince of this world. If we go back to Revelation 11:7 and we find out there's a beast that comes up out of the abyss that makes war with him. Does this beast coming up out of the abyss have anything to do with this head that's been slain and his fatal wound is healed? The whole earth is amazed and followed after the beast. The beast kills two witnesses – nobody else can kill them. Is this the same beast, now that the whole world is going to follow? Is this the same beast that comes out of the abyss and they are amazed because he has a wound and the wound was healed? We begin to put all this together. We do not have all the answers or details but we are building precept upon precept. Revelation 13:4 they worshiped the dragon because he gave his authority to the beast; and they worshiped the beast, saying, "Who is like the beast, and who is able to wage war with him?" This beast is the only one who could kill the two witnesses. Who is able to make war against him? In Daniel 7:25 we see a mouth speaking blasphemies and authority to act for forty-two months. We saw a horn that was part of a beast that had a mouth that blasphemies and was able to act for forty-two months. We know there's a tabernacle on earth by then, we read it in chapter 11. There's also one in heaven. We do not know which one he's talking about. He just took us from earth to heaven. Revelation 13:7 It was also given to him to make war with the saints and to overcome them, and authority over every tribe and people and tongue and nation was given to him. Daniel 7:25 – because that little horn is able to make war against the saints. We know he overcomes them for time, times and half a time. And it tells us here that he's able to act forty-two months and that is the same as time, times and half a time. God, in this progressive revelation, is teaching us more and more and more because He doesn't want us to be in the dark. He wants us to know what is coming to pass. He want's us to take everything that's happening in the world and bring it up against the plumb line of God's Word. He doesn't want us to take the Word and distort or bend it to fit what is happening in the world. Pay attention to the details He gives us. The word worship is used two times in Rev 13: 4 and now it's used again. The word worship is used two times in verse 4 and now it's used again. Those who have studied Ephesians know when He says He's blessed us with every spiritual blessing and chose us before the foundation of the world He shows is in Christ. Here's a parallel. Revelation 13:9-11 If anyone has an ear, let him hear. 10If anyone is destined for captivity, to captivity he goes ; if anyone kills with the sword, with the sword he must be killed. Here is the perseverance and the faith of the saints. 11 Then I saw another beast coming up out of the earth; and he had two horns like a lamb and he spoke as a dragon. The dragon is Satan, the serpent of old. Daniel has rolled out the blueprint of prophecy. He has given us the big picture. He started in chapter 2 and in chapter 7 he's adding details and wait until you get to chapter 8 – it is so good. And then we get to 9 and we'll go out of our mind because chapter 9 is going to tell those Jews when the Messiah is coming. It's going to lay it out. We are going to see it. He is going to tell them when the Messiah is coming. They are going to miss it. Jews do not study Daniel because they think they cannot understand it but it's because they are trying to put on their theological glasses instead of going to the word of God and being patient and looking at it and studying it – precept upon precept and getting the truth and adding to it. Beloved, be patient with our study. All we are going to do is be in prophecy from 7 to 12. When we get 7 down good we'll be ready to do 12 because 12 has to do with 7. Chapter 11 also has to do with 7. It's all going to fit but we have to be patient. Get the details down and remember is a progressive revelation. And by time we get to the last chapter of Revelation we have everything that God wants us to know. Everything that He has laid out so that we that are living during these days are prepared to look at all the events in the world and in sense to pass judgment on them. When 9-11 happened and people were asking if it was Armageddon could we tell them ‘absolutely not'? It's not lined up for it, it's not what the scripture say. Armageddon is coming, are we ready? To read, hear, and heed is to give honor and glory to Jesus Christ. Revelation 1:3, 22:7 Blessed is he who reads and those who hear the words of the prophecy, and heed the things which are written in it; for the time is near... 22:7 "And behold, I am coming quickly. Blessed is he who heeds the words of the prophecy of this book." Revelation 19:10 Then I fell at his feet to worship him. But he said to me, "Do not do that; I am a fellow servant of yours and your brethren who hold the testimony of Jesus; worship God. For the testimony of Jesus is the spirit of prophecy." The testimony of Jesus is the spirit of prophecy, the very breath of prophecy. All of this is pointing to what we are going to study next week. We'll study about the coming of Jesus Christ. We know from Daniel 7 that all this is leading up to the coming of Jesus. We know that 3½ years before the Kingdom is set up there is going to be one who is a little horn out of the 10 horns that is ruling over all the earth and over powering the saints. We know what the last 3 ½ years will be like before Jesus Christ comes because God has told us. We are to look up, our redemption draw neigh. 2Timothy 2:15 Do your best to present yourself to God as one approved, a workman who does not need to be ashamed and who correctly handles the word of truth. We are cutting the Word according to His pattern. Father, thank you. Thank you, Father, for your Word. Thank you, Lord, that you make it clear we are seeing it through a glass darkly but you are polishing the glass with every scripture that we study more light is entering in. And I thank you for where you have us headed and for what we are going to learn. Oh, Father, I just delight in the privilege of putting it all together as we go through and as we see it. Now bless us Father. May we persevere, may we remember Father that we are going to see you, that you say in Revelation that Jesus is coming. "I am coming and my reward is with me to give to everyone according to his deeds." And Father, if you have told us that we are to exert ourselves, we are to study to show ourselves approved unto you, then Father, I pray that we would see that we are doing what you have commanded us to do and that you will reward us for that. So Father, may we not neglect the study of the Word of God, may we not give other things priority. Rather may we put all of our priorities around learning your Word and spending time with you in worship, in prayer, in thanks giving and in the study of your Word. In your name we pray. Amen.